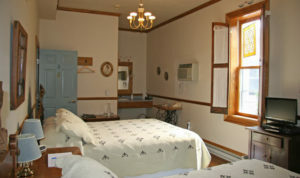 Many travelers are discovering the enjoyment of taking a room at the inn. Long before luxury hotel chains, there were inns and boarding houses. First, coach stops in key spots along established routes provided overnight lodging for travelers and shelter for their horses, offering little more than a meal and a bed during journeys that could take weeks. Later, as transportation improved and travel increased, these accommodations became common in cities and towns. Typically, they were set up in private residences, where homeowners made their livelihoods by offering inexpensive hospitality to those passing through – not just travelers but also cowboys, prospectors and other businessmen whose work took them from place to place. At these inns/boarding houses, weary travelers were given a bed at the end of a long day, and then, breakfast the next morning, before setting out on the next leg of their trip – and the “bed and breakfast” (B&B) was named. Following World War II, a boom in Americans visiting Europe revived interest in the B&B experience back in the U.S., an interest which grew throughout the late 20th century. Currently, travelers in every state can choose from thousands of B&Bs. Now, however, more than a convenient stopover on the way to somewhere else, today’s B&B is becoming a regular lodging destination for many travelers. Across the Old Northwest Territory, hundreds of B&Bs offer an array of styles and amenities that cater to any taste. Here, Northwest Quarterly profiles several, right in our own backyard – from Victorian mansion to modern ranch, riverside to prairie – all with luxury accommodations, legendary breakfasts and professional, personal service provided by friendly, hospitable innkeepers. This historic home became Green County’s first B&B in 1987, following a loving renovation by its residents, only the sixth owners of the property in more than 100 years. 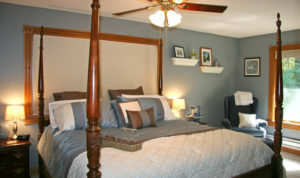 Original hardwood and tile floors, woodwork and pocket doors were restored and modern conveniences brought in. Features: croquet/volleyball equipment; small summer house; many public spaces; bicycle storage (no rentals). Events: For guests, small weddings and/or receptions, family gatherings, craft retreats, special occasions. ”We serve breakfast and snacks for guests, but no other food,” says Margie. Be Sure to Ask About: Margie’s tilt towards art. The barn has been converted into a spacious sunlit studio, where writers, artists and crafters hold workshops. Beautiful pottery, which Margie collects and sells, is on display in the foyer. The property’s namesake, its first owner, was a successful farmer and businessman who was also Walworth County’s first state senator. Its current owners are his descendants, and many of the furnishings are original pieces owned by the family, including a sleigh in the living room and vintage clothing, hats and other accessories that decorate an upstairs hallway. Year built: original cabin in 1843; purchased in 1867 by Gen. John Boyd, who built onto it, creating the space still in use today. 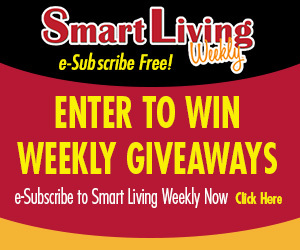 Features: Enjoyable outdoor spaces: gardens; patio; more than 20 varieties of trees. “We’re absolutely full of birds – orioles, hummingbirds, finches, turkeys – and they’re lots of fun,” says Sue. 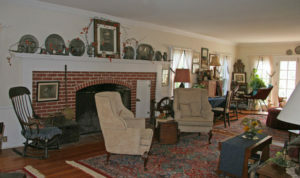 The house is rich in history, with original family furniture, books, sleighs, clothing, décor and more. Activities/Attractions: “There’s so much to do around here – Lake Geneva, Yerkes Observatory, the Kettle Moraine, Big Foot State Park,” Bob says. “We’ve put together a collection of activities in a binder and we have all of the pamphlets from the attractions, like lake cruises and golfing. Of Special Note: The portrait of John Boyd hanging above the fireplace. “It’s fun to have the General looking over our shoulders,” Sue says. Favorite part of the job: “It’s been a joy to fix up the home and share it with people,” says Sue. The main house at this luxurious inn was built in 1968, and was designed by a Taliesen student. 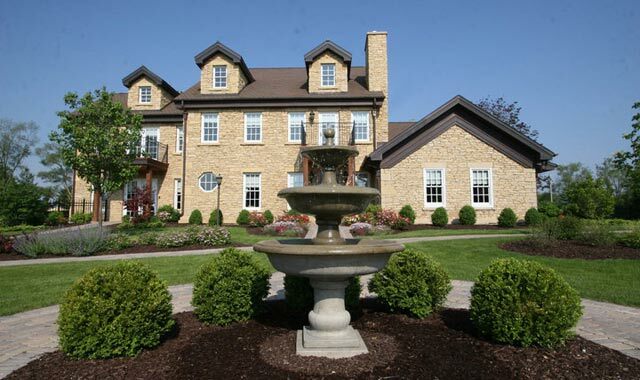 Originally 7,000 square feet, now, with additions, it is 30,000 square feet and features an English country décor. Each suite has its own unique theme. Be Sure to Ask About: First Friday BBQ parties under the stars and authentic Christmas Carol Dinners. River House, Machesney Park, Ill. Features: River views and access; wooded setting; dock; fishing; vollelyball; boat launch; bonfire pits; large sand beach; four-acre grounds for ample outdoor space. Be Sure to Ask About: Patty’s most popular dish, Eggs in a Nest. Of Special Note: The fantastic pieces of western and Native American décor in the Getaway Lodge, and the photo of the original homeowners at the Timeaway Lodge. This comfortable contemporary homes sits on five acres abutted by a 65-foot ravine from a former rock quarry, and features a spring-fed creek. It’s surrounded by woods filled with pine trees and 100-year-old oak trees. Amenities: Private bath & shower; king-size beds; flat screen TV with satellite; I-Pod dock/alarm clock; full closet; wine glasses & corkscrew. 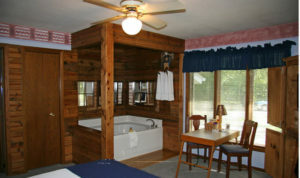 Nature’s Garden includes a whirlpool bathtub; Artist Retreat comes with an oversized bath and dual sinks, Jacuzzi tub & separate shower; three-season porch with view; separate sitting room. Features: Outdoor pool with two decks; large front porch; walking trails; two large stone fireplaces in common areas; wild deer and turkey wander through the yard. Be Sure to Ask About: The fireman’s pole in the middle of the house. 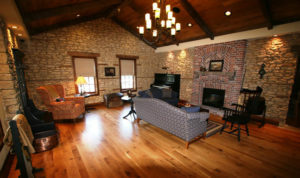 The original 1,000-square-foot limestone home from which the 9,000-square-foot Copperstone Inn sprang is indicative of many historic buildings in the area, and during renovation, its current owners removed decades of plaster and other coverings in order to reveal the 14-inch-thick limestone walls. Activities/Attractions: “The property is 135 acres with wooded nature and hiking trails and gardens,” Saundra says. “We have two ponds for fishing and many birds that come to the feeders and houses we have all around.” The Inn is just 6 miles from Rockton, Ill., with quaint shops, and within 15 minutes of Rockford. “We provide full concierge services for guests, with lists of attractions, museums, dining and shopping,” says Nikki. Be Sure to Ask About: The organic apple orchard of 5,000 trees on the property. 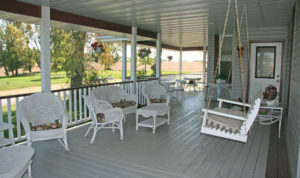 Features: Quiet, rural setting; gorgeous veranda with lots of seating; homey atmosphere. Activities/Attractions: “Guests can go to Rockford or Freeport for museums, shopping, state parks, shows,” Ret says. Be Sure to Ask About: Ret’s wall maps, one of the U.S. and one of the world, with pins indicating where her guests have come from, including Morocco and Saudi Arabia. “I’ve finally had someone from every state, since someone from Rhode Island stayed here this summer,” she says. Of Special Note: Zealous Packer Backer Ret’s collection of Green Bay memorabilia, including a Christmas tree decked out with Green Bay Packer decorations. Originally built as a home, this structure became the city’s first inn, in 1851. Inside, the original brick walls are exposed and the space is filled with historic photos and documents and antiques. Be Sure to Ask About: Room No. 4, where Abraham Lincoln was given lunch and lodging in 1856. Of Special Note: Each room features a unique, locally crafted, stained glass quilt pattern in one of the windows. Editor’s Note: All of the B&B innkeepers interviewed said that next to the fantastic breakfasts, their guests most often comment on the friendliness of the staff – and that’s usually one or two people! This entry was posted on Tuesday, October 30th, 2012 at 11:57 am	and is filed under Recreation & Destinations. You can follow any responses to this entry through the RSS 2.0 feed. Both comments and pings are currently closed.